FarmBoy and CityGirl hit Asia: P,P,P,Pepero! Last thursday was a rather special day here in Korea, not special in the I-get-the-day-off-to sleep-in-and-drink-hot-chocolate-in-this-freezing-cold-weather kinda way, but rather in a here-some-snacks-for-you kinda way. 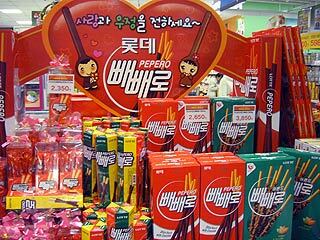 Basically, the 11th day of the 11th month (11/11) has become known here in South Korea as Pepero Day. It’s held on November 11, since the date “11/11″ looks like four sticks of Pepero (*ummm…what about a biltong day back in South Africa??? *) It is mostly young people and couples who exchange Pepero sticks, other and other ‘romantic gifts’ Lotte (one of the largest food and shopping groups here in South Korea…even with its own designer Department Stores and cinemas) denies starting the holiday and instead states that they noticed a bump in Pepero sales around November 11th and after continued popularity they decided to then encourage the holiday with special gift boxes and other promotions. Hmmm ya right Lotte! Especially as they makes 55% of their yearly sales in November!